I read most of your blogs and wonder if you could write about tagging 16bit versus 24bit files. Should there be any difference in the tag? Or in file/folder naming maybe? [...] I’m using FLAC and MP3 only. If I have a FLAC version I will delete the MP3 album from my library. But with 16bit versus 24bit that’s different. For example; I would like to keep the original 16bit Nirvana Nevermind if I had a 24bit version as well. Onto our question. It comes down to how you want to use your music library. And from there, a consideration of how well your music player can support those aims. Start with how you want to browse, navigate, queue up and generally listen to your music library. If you have both the 16 and 24bit versions of a given album, it seems likely that you will want to choose which version you play. If you're in your lounge with a top-end Hi-Fi, maybe you want to play the 24bit version. If you are sync'ing with your smartphone to listen whilst jogging, the 16bit version might be better. What I would guess you generally don't want is for the tracks to be combined and track one play in both formats, then track two, and so on. So if you need a way of separating your 16 versus 24bit files, you will need some way of classifying them. Fortunately this metadata will already be stored in the audio header for each music file. These are not strictly "tags" as normally discussed on this forum, but metadata about the audio data within a music file. FLAC stores its sample rate information in each STREAMINFO block. But that's only half the battle; you might have the data, but whatcha gonna do with it? Ideally, the music player should allow you to filter the files by the sample rate. That way, you would be able to choose the 24bit version of an album. 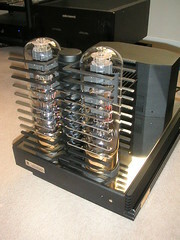 Many of the more audiophile oriented music players support this; the Computer Audiophile software forum is a good place to see what others are using. However, support for this is generally lacking, and sometimes you don't have control over your music software (e.g. that embedded in certain hardware) so tags are sometimes used which are better supported. If your music player supports it you can use a custom tag, and the worst case is to use something like genre (or add an artifact to the album name e.g Nevermind [24 bit] - yeuggh). Another possibility is to maintain a separate library of music at different sample rates. These libraries can then be added to your player. But the key thing here is how well the player will delineate between the libraries; if albums are just shown in the same way that would be of little use. So to sum up, it depends on your music player... as ever! Thanks to audiophilia for the image above.